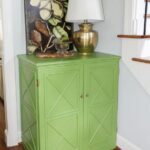 Today, I’m thrilled to be sharing my entry into the Fab Furniture Flippin’ Contest. I’ve been wanting to try my hand at an Ikea Hack for quite some time and this month’s contest theme; “Icing on the Cake” featuring D. Lawless Hardware seemed like a good fit. 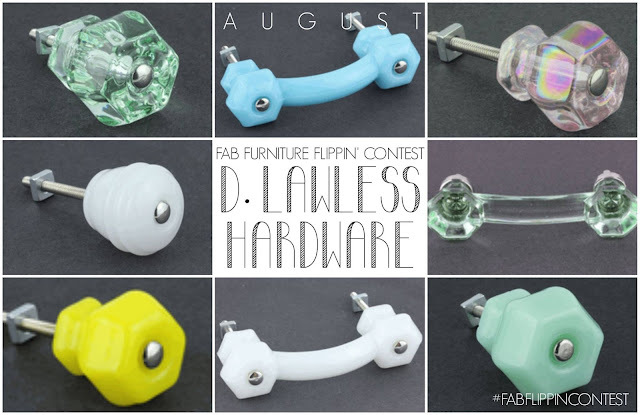 *I was gifted hardware of my choice from D. Lawless Hardware for participating in this contest. All opinions and ideas are my own. 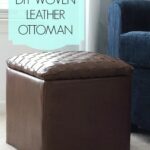 This post also contains affiliate links for your ocnvenience. I was like a kid in a candy store picking out hardware for this project. And found just the right look for my project. 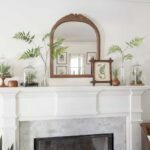 In case you don’t have slightest idea what I’m blabbing about, the Fab Furniture Flippin’ Contest (FFFC) is a sponsored monthly contest for bloggers who love to makeover furniture. To make it even more fun there’s a different theme every month! The chosen contestants compete for a grand prize by that month’s sponsor and create a new piece of furniture/makeover! There are six fab hosts and guest judges every month, so it’s fun but fair as well! UPDATED: Guess what y’all my entry won Second Place!! Woo hoo! Let’s get to my entry shall we? 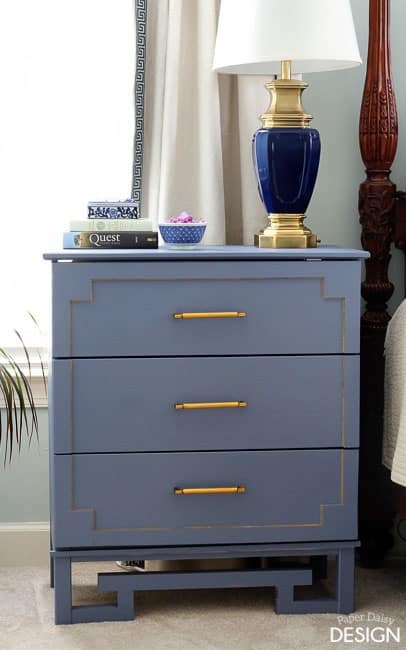 I have been wanting a painted piece of furniture in my master bedroom to break up the matched set of furniture with something more graphic. 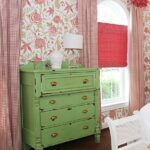 The greek key details of the dresser continues the look created by the custom embroidered trim of the curtains. I was inspired by two images for my hack. Neither of which seem to be in production any more. 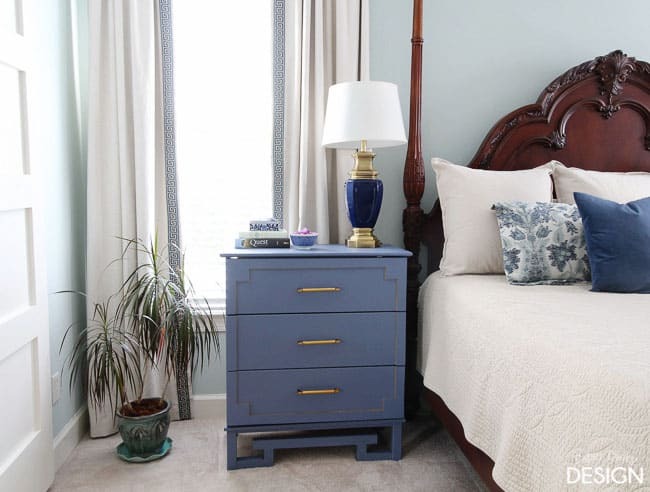 Obviously, I started with the Tarva Dresser from Ikea. It’s a bit larger than the popular Rast and has two legs that make it a bit taller too. It was just the size I needed for my rather tall bed. I began by filling in the existing holes made for the knobs. 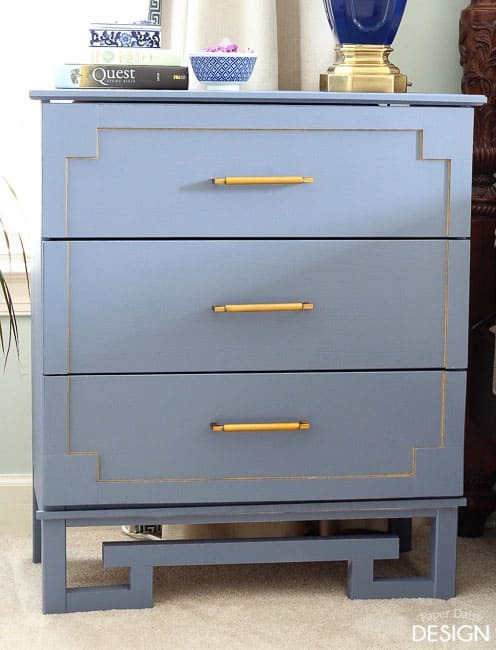 As you could see from my finished photo, I used gorgeous gold/bronze pulls instead. 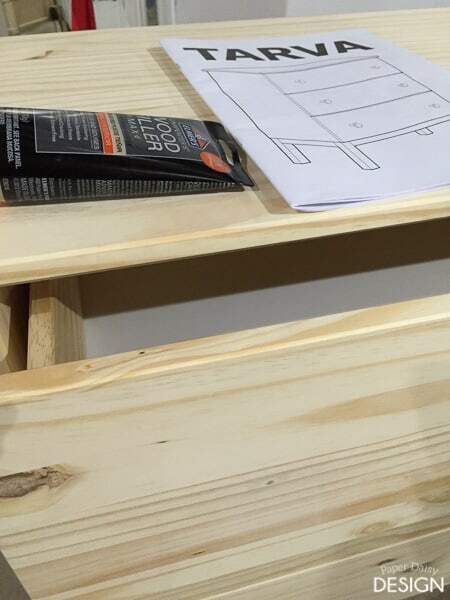 After I gave the dresser a coat of primer, I framed out the drawers with flat pieces of wood trim. Here is a list of materials. 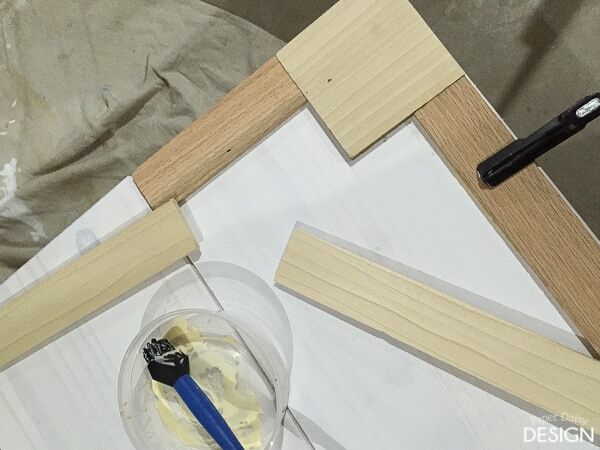 Using a Silicone Glue Brush , I evenly coated the back of the wood with wood glue. 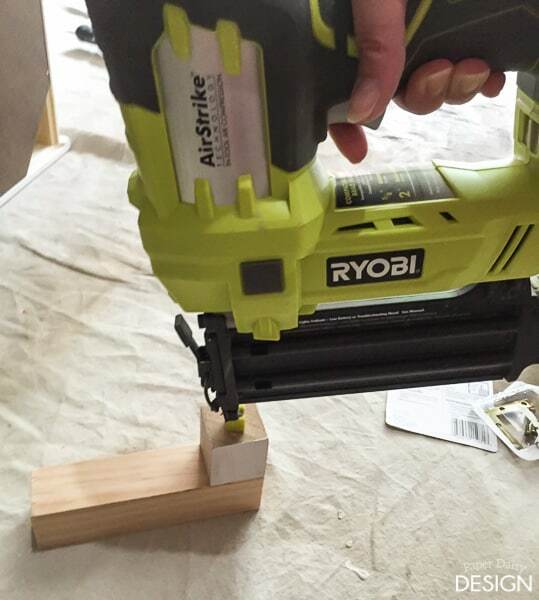 This handy tool prevents excess glue from oozing out the sides. I can also stop fighting with the bottle of glue and just pour some out into a plastic container. And used my nailer to secure the trim into place. 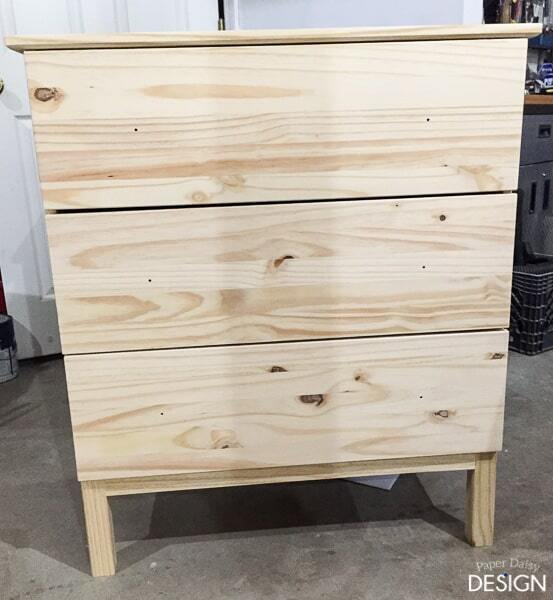 I was able to nail all but the bottom trim to the sides of the drawer. 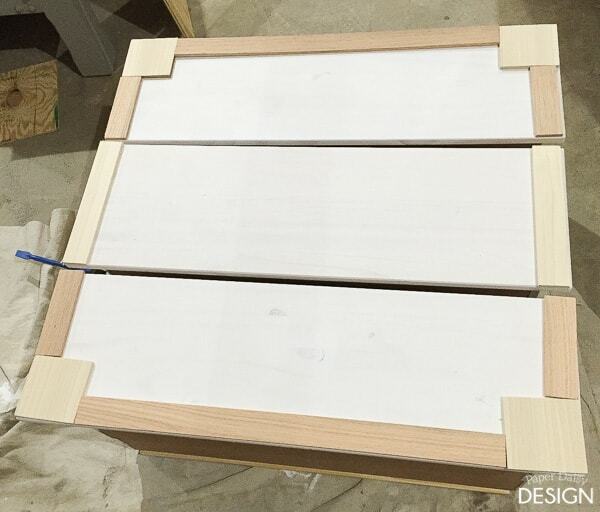 I also added a square dowel to the top lip of the dresser and to the bottom, just under the drawer. 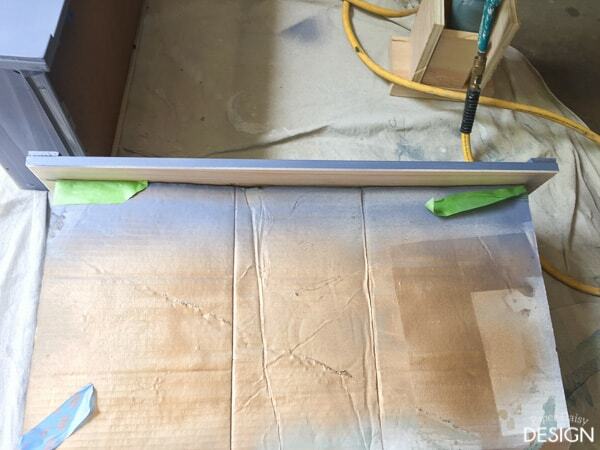 After priming the trim, following with a 400 grit sand paper created a smooth finish for the top coat. Then I painted my leg trim pieces. This was a high grade 2×2 wood. It’s a little more expensive ($8 as compared to $2) but it’s straight and has square corners. Then I nailed the small blocks to the bottom of the leg pieces. You may also want to add some strong adhesive like Gorilla Glue. Then using flat corner braces I attached them to the existing legs. 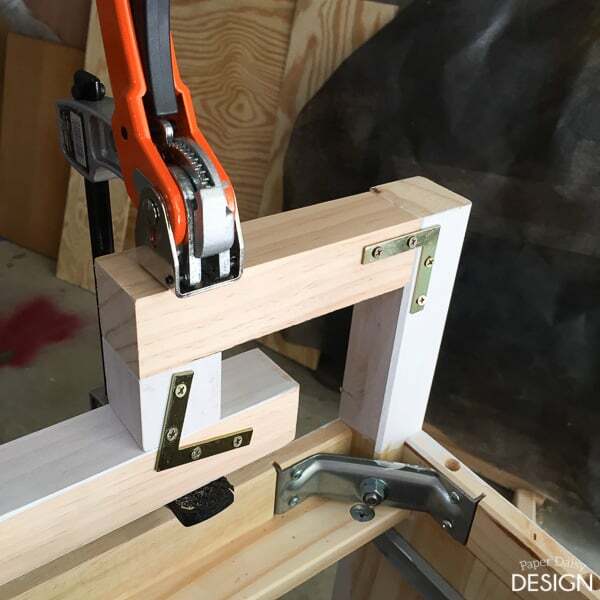 If you are working alone, it’s good to have some clamps around to hold the blocks together. 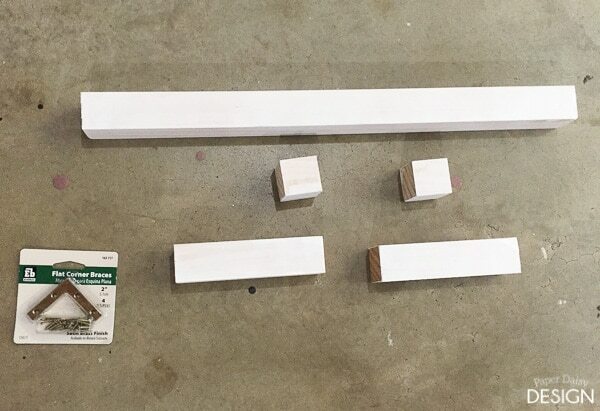 Don’t forget to use a little wood glue in each joint. 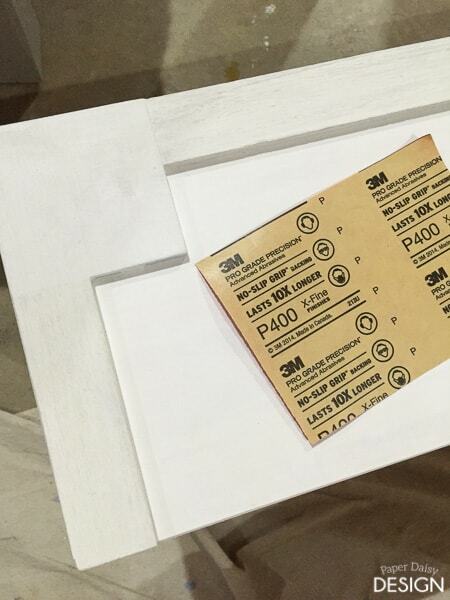 Follow with some wood filler for a smooth transition. Sand well once it’s dry. 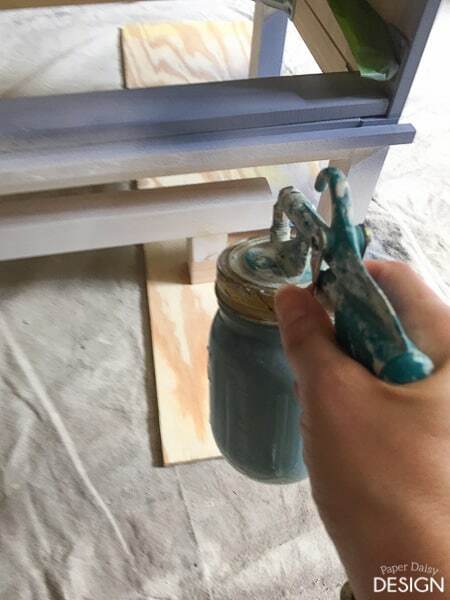 I chose to spray paint my piece with my favorite spray gun, the Critter Spray Gun . It’s a great choice for a smooth, airbrush style finish and is great for latex paint. I used Sherwin Williams Semi Gloss in Distance SW 6243. I used this handy tool to paint all of my kitchen cabinets too! The only problem I’ve ever had with this gun is finding the right way to set it down. So I built this rudimentary caddy to hold it up straight. 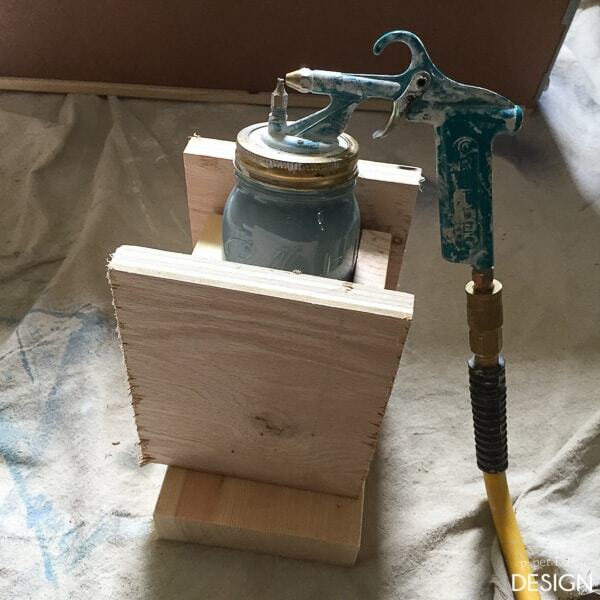 This paint gun creates a perfectly smooth, air brush like finish after 2-3 very quick coats. I also sanded with 400 grit sandpaper in between coats. 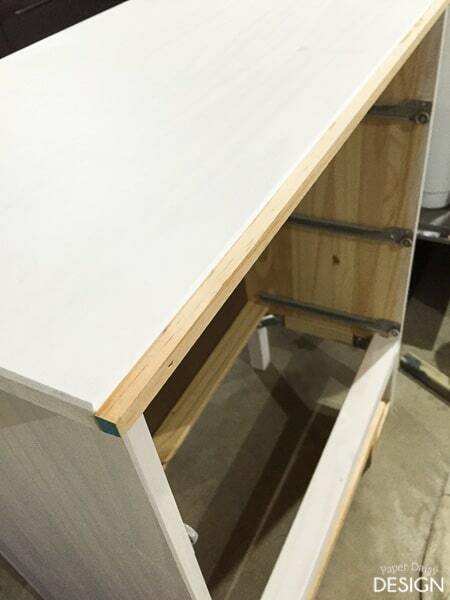 I sanded not because of the sprayer, but because with the raw wood, the grain was pulled up by the paint. To protect the inside of the drawers I taped some cardboard over the drawer. I finished the newly created edges with a Sharpie Gold Paint pen. I just love it how it turned out and how much style it brings to the space. 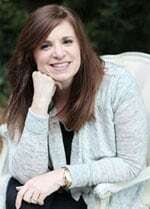 Be sure to check out the other entries featured in linky’s on their sites! There Flipping’ Fabulous!! 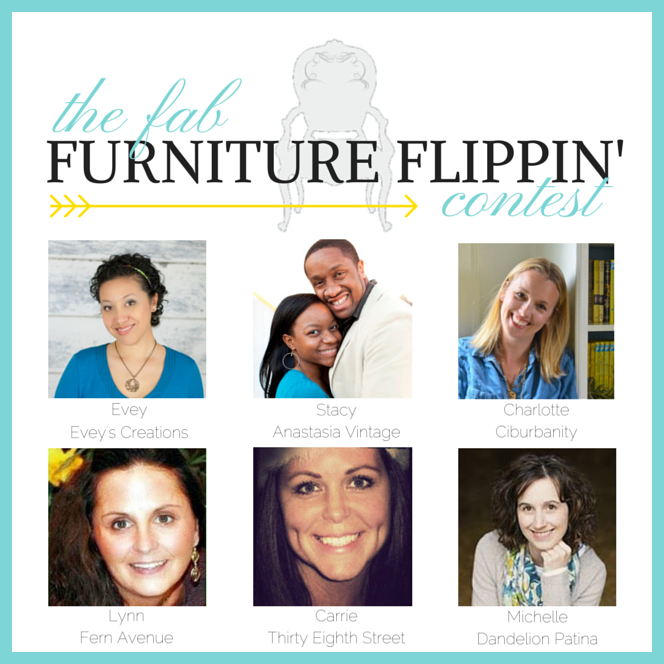 The Fab Furniture Flippin’ Contest is open only to the entrants who have signed up through the group Facebook page. 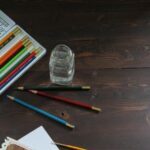 If you are an active, furniture flippin’ blogger and you’d like to participate in future contests, we’d love to have you! Please contact Evey (info@eveyscreations.com) or Stacy (info@anastasiavintage.com) to find out how! Disclosure: I received product for this post, but all opinions are 100% my own. This post contains sponsored links from D. Lawless Hardware and affiliate links to Amazon. Thank you! Be sure to check out my giveaways in the side bar. 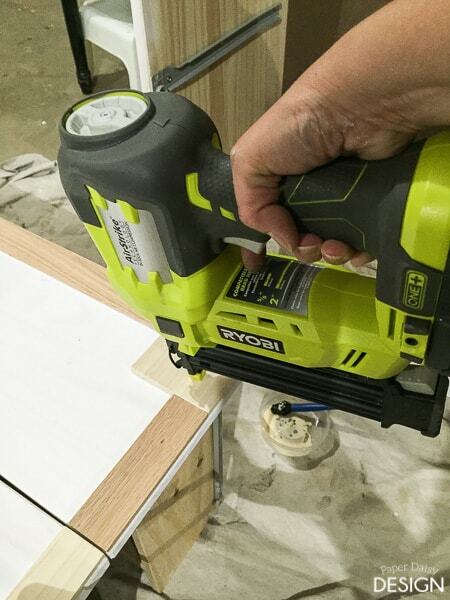 I’m giving away a RYOBI Sliding miter saw!! Amazing transformation. Those pulls make the entire piece. Fantastic job!!! Thanks! They are so gorgeous and the color of the finish is so warm and beautiful. 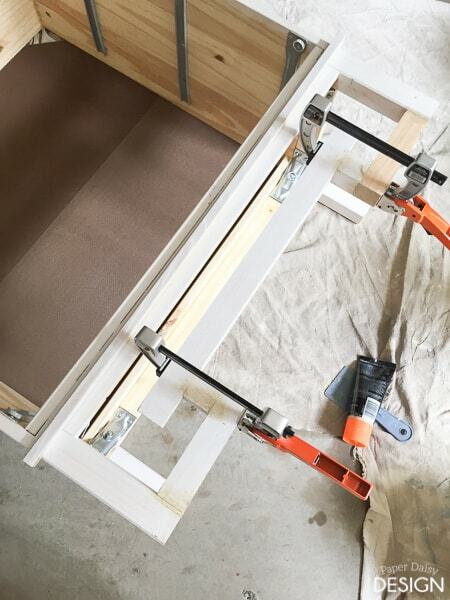 I didn’t realize that you had added the wood trim on the drawer fronts, till I saw the unfinished piece. I love how it turned out! 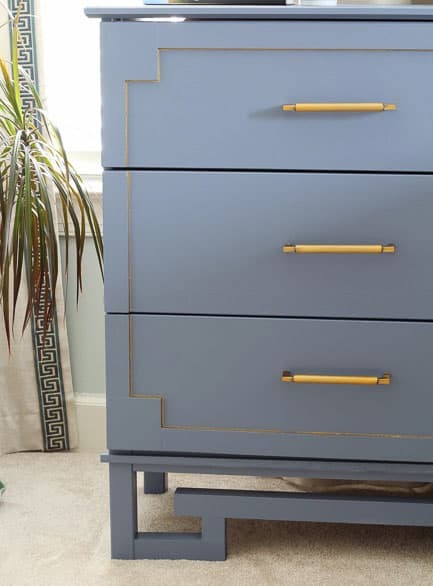 The gold edging compliments the handles really well! 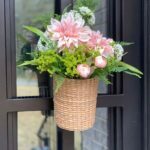 Looks pretty in your room! Thank you Mary, while you can’t see it from just these images I’m trying to mix my metals in this room to give it a more contemporary feel. 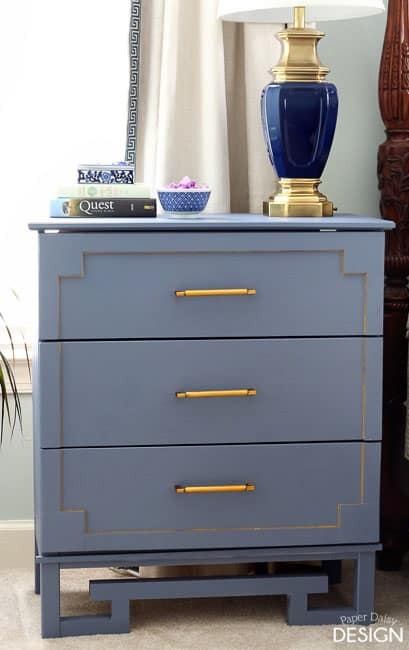 I was nervous to create the gold edging but with a gold sharpie it was very easy and it was so worth the effort. 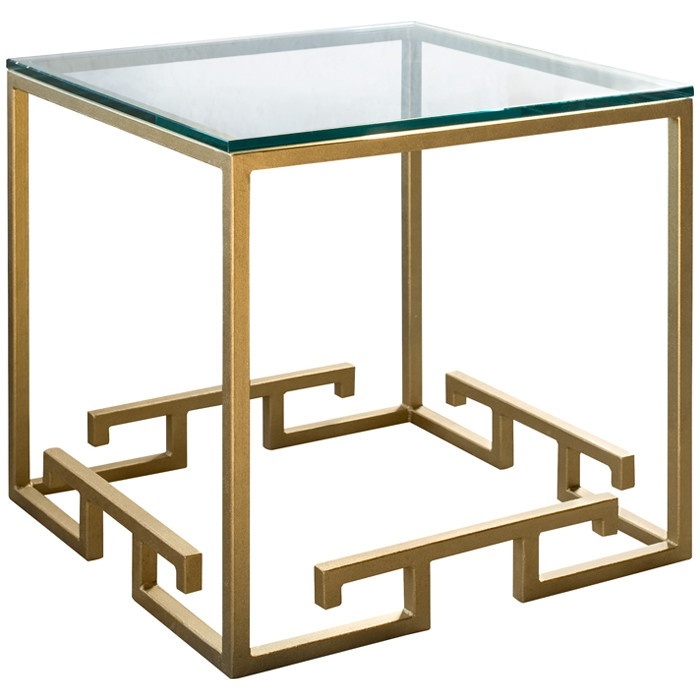 Boy I have to make a trip to my local Ikea, Being more drawn to vintage pieces I really don’t consider Ikea as a source, Well these basic pieces are pretty versatile for design! 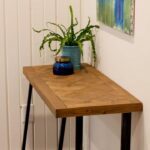 I think you just swayed me a bit, and have inspired a ikea hack board on pinterest for me, you did such a great job on this! Coming over from any thing blue party. Amazing transformation, absolutely heart the Greek key leg. Wowza! I absolutely love this piece! Great job and thanks for linking up!! Congrats on winning the challenge! I wish I had this in my house!!! Thanks for the tutorial! 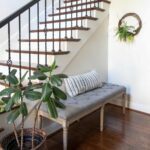 Stopping by from Your Inspired Design Link Party. Awesome makeover Leslie! Thanks for sharing it with us at Work it Wednesday. I’m featuring it tomorrow morning!! Thanks Marie!! I appreciate the share.